As the sun rises over Rocky Mountain National Park, clouds and fog begin to lift their veil from the mountaintops. 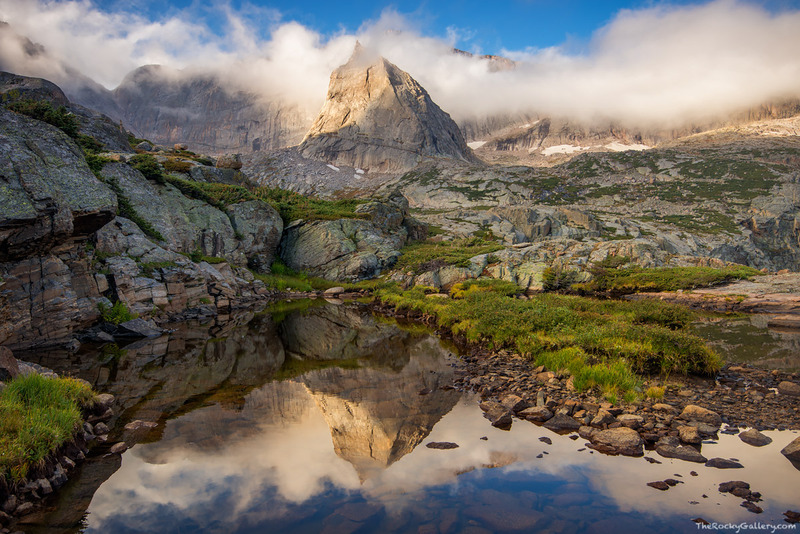 The Spearhead appears through the clouds deep within Glacier Gorge and reflects in an alpine tarn near Blue Lake. Photographing the famous Spearhead formation in RMNP is a challenge. It's an impressive peak and one that is popular with climbers. The Spearhead is located just behind Longs Peak and becuase of it's place behind a 14,259 ft summit, the sun takes some time to make it's way onto the Spearhead. Conditions this August morning in Rocky Mountain National Park were just about perfect and the Spearhead looked majestic cloaked in fog and clouds. Photo © copyright by Thomas Mangan.